Snoop Dogg is infamous for so many disturbing reasons. He helped bring the thug life to the mainstream with the evolution of rap/thug culture in the early ’90s. He is outspoken on many issues in the black community that continue to keep minorities in the slums and ghettos. And he also just “shot” Donald Trump in a music video. Snoop Dogg is a scumbag. You’d think with the liberal narrative being pushed these last two plus years that all black Americans are against Donald Trump. You’d also be dead wrong. Some great black Americans are standing up for Trump by the truckload, one such example is Steve Harvey. 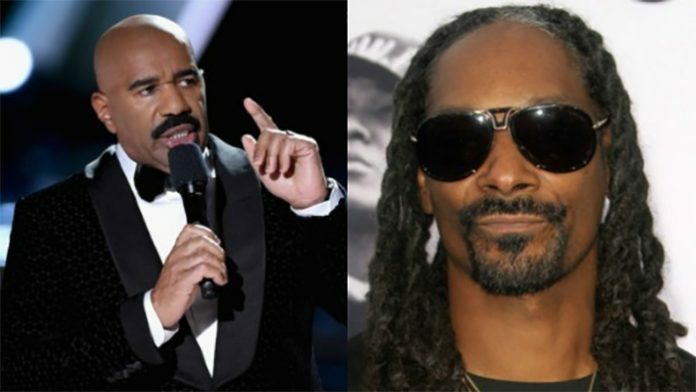 An American institution at this point, Harvey is a staunch supporter of Trump and what he just said to Snoop is exactly what the backwards, aging, wannabe thug loser needs to hear. I mean A-freaking-MEN! Finally someone in the media spotlight has the cojones to speak out and shut Snoop and all these people up for good. And Harvey’s point is all too real. What if there is someone out there looking to be the next Lee Harvey Oswald? What if there is someone who wants to be a lone gunman? This sort of thing needs to be squashed immediately. Imagine the outrage if it was Hillary (God forbid) and a country artist made a video about shooting her? We’d never heard the end of it in our lifetime. Don’t let the mainstream media hide this story and keep sharing and posting this whenever and wherever you can!